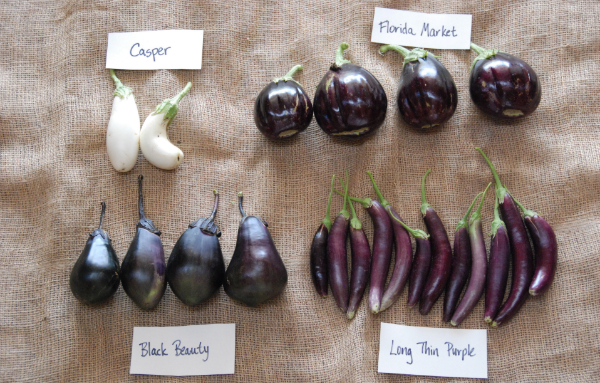 Here is a look at the Eggplant varieties we are growing and trialling this year. 'Casper' is new to us...and I have to admit being a bit resistant to trialling it. Isn't one of the best things about eggplant the incredible purple colour? But the promise of a less bitter tasting eggplant won me over. Eggplant 'Black Beauty' Heirloom variety introduced in 1902, the fruits are dark purple and glossy with an excellent flavour. Eggplant 'Casper' Casper' is a French heirloom with delectable, ivory-white elongated fruits. White eggplants are firmer, creamier in texture and less bitter than purple types. Eggplant 'Florida Market' Heirloom variety from Florida, USA. Glossy dark purple teardrop shaped eggplants. Excellent for slicing, stuffing, and baking. Eggplant 'Long Purple' An Italian Heirloom from the 1800's, 'Long Purple' has a milder, more delicate flavor than regular eggplant. 'Long Purple' has just a few seeds and a thin skin that makes it easy to cook. This is an excellent eggplant for curries.